Jewish Federation & Family Services Orange County (JFFS) is a proud partner of the Birthright Israel Foundation. With this partnership, we have created The OC WAY, a community for ages 21-26 that enables young adults to experience Birthright with others who live in Orange County. DEPART FROM LAX! Almost every Birthright Israel group departs from the East Coast, requiring participants to pay their own way to get there. We already know that you live in OC, and don’t want to make you pay for a round trip ticket to New York. Travel with Israelis for all 10 days of the trip (not just the usual 5 of other trips), and get to know your Israeli peers, hear their insight, and see what life is life from a local perspective. This is extremely unique, and a rare opportunity not offered on other trips! Unique opportunity to create relationships and connections that will last a lifetime. Your trip staff live in Orange County. Get to know them before the trip, and ask questions along the way! You don’t need to be outdoorsy to come. What you do need to be is curious and open minded. You also don’t need to have any particular religious background to go on this trip; some people are secular Jews, some are observant. Some people haven’t been connected to their Judaism in a long time. The OC Way is designed to fit everybody’s needs along the spectrum. Every Birthright Israel participant, regardless of trip provider, can look forward to these essential experiences during the course of their 10-day trip: The Old City of Jerusalem, Mifgash (Israeli peers on the trip with you), Tel Aviv beaches, floating in the Dead Sea, Israeli nightlife, climbing Masada at sunrise, a night under the stars in the Bedouin tents, Camel rides, and so much more! 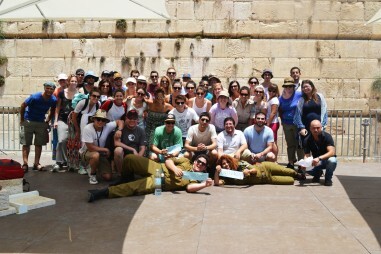 The OC Way trip partners with Shorashim, an official trip provider for Birthright Israel. Shorashim is a non-profit organization, every penny goes towards making your trip the best for you, ultimately ensuring that you have the time of your life on a life-changing experience in Israel. Shorashim has been awarded for overall excellence, which means we offer you only the best itineraries, education, staff, and logistical coordination, in addition to having stellar marketing, recruiting initiatives, and so much more! With Shorashim, you know you're part of an organization that is not only highly-accredited, but also extremely passionate about making your trip the best possible! You live and experience Israel through the eyes of Israelis! Shorashim’s vision is devoted to building bridges between Israeli and American Jews. Mifgash, the encounter between Americans and Israelis, is the foundation of Shorashim, which is why on all Shorashim trips Americans and Israelis travel, live, and learn side-by-side as they explore Israel together for all 10 days! Shorashim is pluralistic, which means no matter what your background or level of observance is, you will have an amazing, comfortable, and enriching experience with us! To find out more about Shorashim! Click here to check out their website!